This election season five California counties are doing away with hundreds of neighborhood polling places and replacing them with fewer “one-stop vote centers”—an experiment sold by Democrats as a way to save money and boost anemic voter turnout from the last mid-term elections. The 2016 Voter’s Choice Act establishes the vote centers in Madera, Napa, Nevada, Sacramento, and San Mateo. Like traditional polling places, the centers will be located mostly in churches, firehouses, high schools and other community buildings. The difference: Voters will be able to do all things voter-related at any center in their county. “This is the single biggest change we’ve seen in our elections in California,” said Mindy Romero, founder and director of the California Civic Engagement Project, a non-partisan research group. People will be able to not only vote in-person or drop off their ballots, but also pick up replacement ballots and make use of language assistance and translated materials. Crucially, they’ll also be able to register to vote on the spot—without the inconvenience of having to make what would otherwise be a required trip to the county registrar’s office to do so. Here’s how it will work: Every registered voter in these five counties will automatically receive a ballot in the mail, which they can either return by mail, place in one of the many drop boxes in spots such as libraries and courthouses around the county, or take to any county vote center (including one near their work or along their daily commute.) And they’ll be able cast their ballots in-person up to 10 days before the election, or in a dropbox up to 28 days prior to election day. These voters can wave goodbye to polling place restrictions and to voting alongside their neighbors. The vote center model is new. However, vote-by-mail-only elections have happened in some California counties before. San Mateo and Yolo counties did a trial run in their local elections, mailing ballots to every registered voter in the county. It was a part of a pilot program the Legislature authorized in 2014 (San Mateo) and 2009 (Yolo). Results were mixed: San Mateo saw an increase in voter turnout and no change in the overall election cost. Yolo saw no significant boost in turnout, but saved money. Alpine, Sierra, and Plumas, all rural counties, were given special permission to adopt a vote-by-mail-only system. Plumas County introduced vote-by-mail for all in the 2016 primary election. Many Californians who haven’t participated in an all-vote-by-mail election seem leery of the changes. A survey by the Engagement Project found that 61 percent of Californians don’t like the idea of vote centers replacing neighborhood polling places. Voters expressed concerns about everything from driving times to the vote centers, to trusting that their ballots will be delivered and counted. In Colorado’s 2014 elections, the state sent every registered voter a ballot by mail, eliminated assigned polling places and established vote centers where any voter in a county could cast a ballot. The new voting system saved Colorado money, but the state did not see a significant increase in voter participation. California’s law is similar to Colorado’s, with one obvious difference: Here, counties were not required to switch to vote centers. California allowed 14 counties to try the vote center model for this year’s election, but only five opted to do that. In the last statewide election, 58 percent of Californians who voted cast ballots by mail—a percentage experts expect to only increase, which is why the state foresees fewer people using neighborhood polling places. Will voters know where to go, what to expect? Will the lines be DMV-like? Will voting increase? 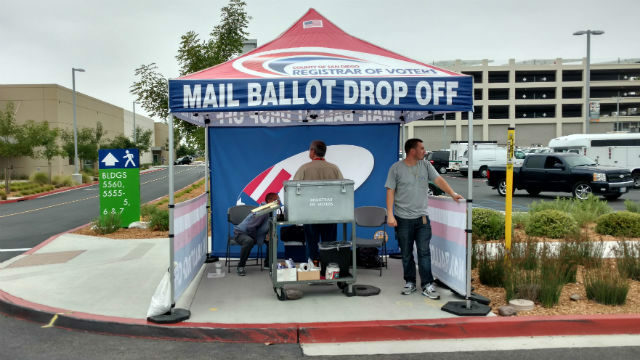 Other counties throughout the state will be watching closely—in the 2020 election, every county except Los Angeles may opt to switch to mailing ballots to all registered voters, and they all can replace polling places with vote centers.